The R600 uses airbags to massage your feet, calves and thighs and even has a vibration function in the seat. Sore from head to toe? ... The REPOSE R600 has you covered. Every decent chair can massage from a person's lower back all the way up to their neck, but what about the lower body? 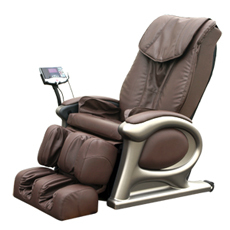 The R600 uses airbags to massage your feet, calves and thighs and even has a vibration function in the seat. Before each massage, advanced sensors built into the R600 will complete an upper body scan to ensure the best possible massage for each individual user. 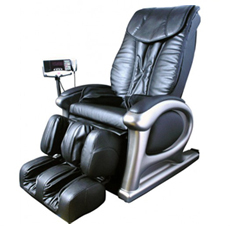 This advanced technology works seamlessly with the massage chairs integrated programming. Listening to relaxing music is universally accepted as great way to unwind. With that in mind, the R600 comes with an incorporated MP3 player and head phones. Download your favorite songs off of your computer and onto the provided USB memory stick, plug the USB stick into the back of the chair and sit back and relax. The R600 even has a Rhythm button that will actually synchronize your massage with the music. Sometimes your muscles need a little heat to help get the blood flowing in order to ease the tension. With that in mind, the R600 has added a heat feature to both the lower back massage and the foot massage. The comprehensive control panel for the R600 is just as stylish as the lounger itself. An LCD display is a must have item for any high end lounger and our display will please even the most discerning client. 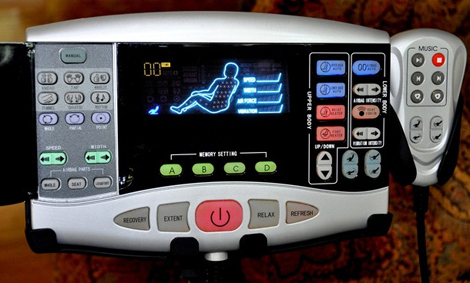 Without being overwhelming, our panel displays massage modes, massage locations, pressure points being massaged, vital massage functions (style, speed, intensity) and even a timer! Wheels located on the rear of the chair make moving your lounger a one person job.